It comes as no surprise to me that a study in the September/October 2008 issue of the journal Marketing Science lists Japan as being the most innovative country in the world due to it having the fastest adoption rate of new products and technologies. When I lived there years ago I was in awe of the stark contrast between old and new: the Japanese love their traditions but they also love the latest high-tech gadgets. I nicknamed their high tech toilets “Spock Toilets” because they seemed to fit in more on the Star Trek bridge than in bathrooms. I won’t even say how much cooler my Japanese cell phone was in 2000 compared to what’s available in North America today (it tends to annoy people when I rub it in). 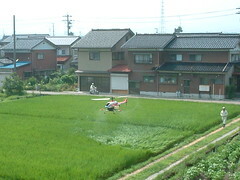 Even Japanese rice farmers are hip to the latest technology: they spray their rice fields with remote-controlled helicopters. Norway, Sweden, The Netherlands and Denmark take the next four places and the US comes in sixth place. Clearly a nation’s wealth affects how quickly it embraces new products. Yet culture also plays a role: culture catapulted some newly developed nations like South Korea and Venezuela higher on the list than the more established Mediterranean nations who might be technically wealthier. India, the Philippines, Indonesia, Vietnam and China were ranked the lowest of the 31 countries that were surveyed. The biggest takeaway from the study was that managers need to know which nations are the most innovative in order to develop effective strategies for their product launches. They also need to consider that the type of technology also matters to adoption rates. For example, “fun” gadgets (cell phones, digital cameras) were adopted five years faster than “work” technologies (essentially household appliances). Therefore fun products should be introduced at the same time across nations (a “sprinkler” strategy) while work products should be staggered and concentrated (a “waterfall” strategy). It was also interesting to note that “time-to-takeoff” of new products is shortening over time and converging across developed countries. Now that’s good news for technology entrepreneurs. I found myself wondering though: does an early adoption rate really qualify a country as being the most innovative? According to the study, it does. The rationale is that with more and more products being introduced at faster and faster rates, a product’s time-to-takeoff in a given country has become increasingly important. A fast adoption rate shows how fast the country can embrace and adapt to technological change and thus how truly innovative it is. What do you think: does the time-to-takeoff really reveal how innovative a country is? Or are there other important indicators?